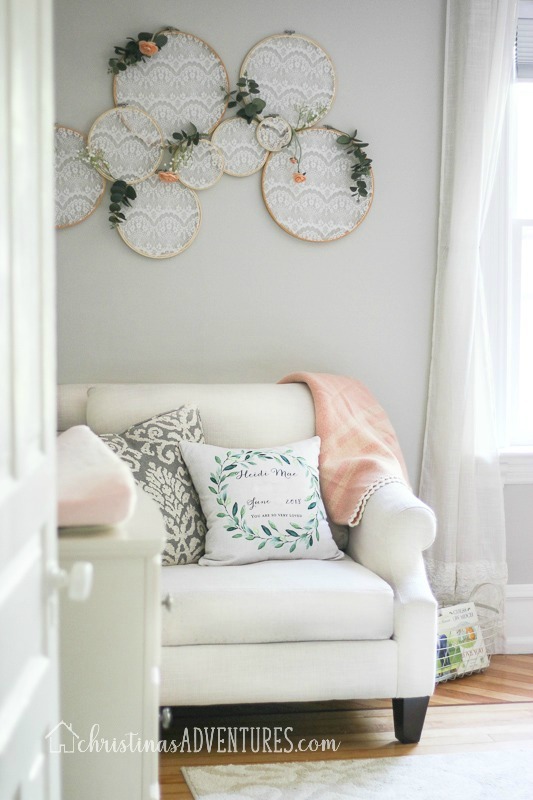 This baby girl nursery design is soft, feminine, and perfectly cozy for those newborn snuggles. Gray walls and touches of soft pink and vintage elements make up this space. Affiliate links included – full disclosure here. This chair is no longer sold – very similar option here with great reviews. We didn’t do a major overhaul of this room since we had just painted the walls and hung curtains 3 years ago when Nora was a baby (see what it looked like when Nora was a baby here). I still loved the wall color (Revere Pewter – see all of our other paint colors here) and I really love how the gray works with the soft pink. This shelving unit is no longer sold – I LOVE this as an option for nursery storage though! Our “color scheme” for this nursery was soft pinks, greenery, wood tones, and then the neutral gray and white background. By keeping this color scheme, we were able to tie in a lot of things that weren’t specifically made for nurseries/babies. The nice thing about doing this is that we will be able to use them in her room as she gets older, or we’ll be able to use them in other areas of the house. Decorating this way really saves money in the long run! This mirror is no longer sold, but there’s a really similar one here! Instead of lots of little things on the walls, we chose to do bigger statement pieces. We had that mirror in Nora’s nursery and loved it! These photo canvases were from Shutterfly and I love how grouping the three of them together makes such an impact over her crib. I am really in love with the hoop art that we put over her oversized chair. It really set the tone for the soft and feminine vibe we were going for. I will share my own tutorial for this soon, because I did a pretty different approach, but it was inspired by this design by Erin at CottonStem. I love this personalized pillow! Here’s where to buy it. We actually had this crib from when Isaac was a baby – we got it secondhand and I LOVE it. Someone was kind enough to let us buy it for $100 (which was all we could offer) when she had it listed for $250 – she was so sweet and wanted to make sure it was going somewhere that it would be loved and used well (and didn’t end up on a sale site a few weeks later marked up higher). I wish I still had her contact information so I could show her we’re using it with baby #3 now! And this space is really sweet to me too. I had that Precious Moments picture my aunt made for me hanging up in my room as a child. You can see more about that shadow box in an upcoming post! All of the Beatrix Potter figures were part of my nursery when I was a baby as well, which I just really love. Love the printable we got – super inexpensive! This is the shop I got it from. While the nursery isn’t fancy, it’s a combination of things that have been loved over the years (this rug used to be in our family room in our first home). It’s a sweet space that I’m really excited for our baby girl to grow with over the next few years. We have had this rug for years and love it!! See more details about it here. What I also really love is how it looks from our hallway. I believe that every space in your home should work together – you shouldn’t feel like you’re walking into a totally different home when walking in and out of different rooms in a house. 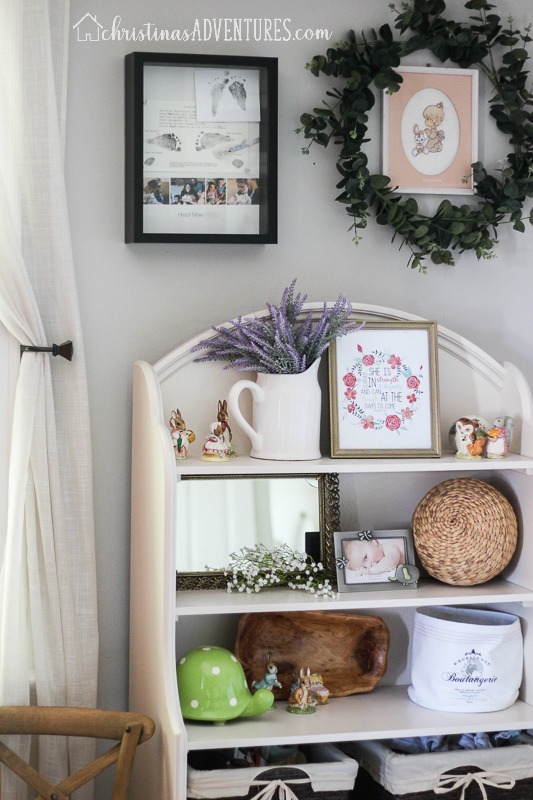 I think this nursery is perfectly soft & feminine and also works with the rest of the spaces in our home. Learn how to make these simple DIY picture frame ledges here – and where to buy schoolhouse lighting fixtures here. If you like this baby girl nursery design – please share with others and save for later by pinning it here! Looks so lovely for your sweet baby girl. This totally works for my baby nursery. I can totally see that.